When I was growing up, I would stand for hours staring at this picture that hung in my grandparent’s home, morbidly fascinated by the chaos, the scalpings! My grandfather, T. E. Stephens (Pop-Pop) was gifted the picture when he, Mother and Grandmother Libby visited her sister Willa Jean in New Mexico in 1956. Pop-Pop and Jean got along beautifully and when he told her how much he liked it, she sent it back to Bama with him. Jean was our family’s outdoorsman –she once killed a walrus in Alaska. It pains me that I do not know her “story”, but I think that the two of them- Pop-Pop with his easy sense of humor, and the audacious Jean would smile to see it now handing above my kitchen table, so that the family can enjoy a good scalping with each and every meal! The cleaning and reframing were painstaking, but well worth the effort. 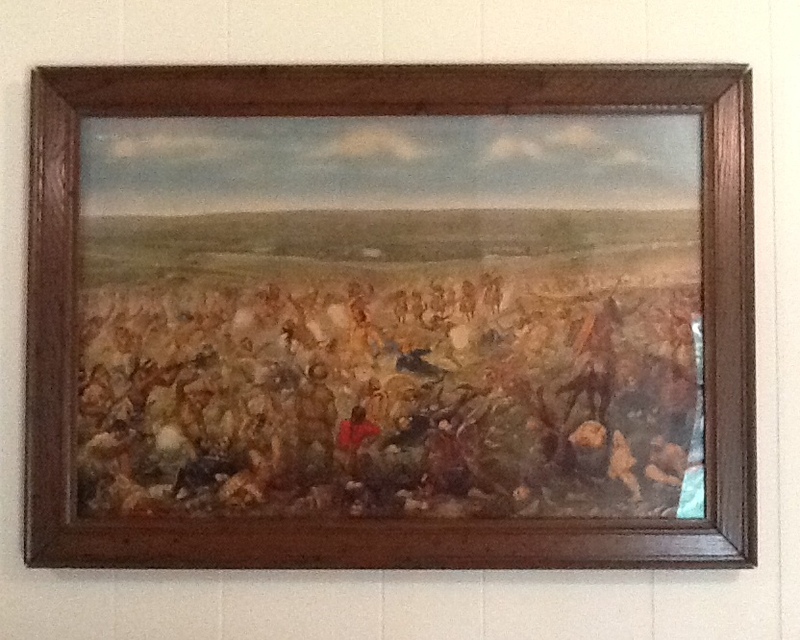 The picture is a depiction of The Battle of Little Bighorn, often referred to as “Custer’s Last Stand”. It is titled “Custer’s Last Fight”, Anheuser Busch 1952. The original painting was presented to the Seventh Regiment U.S. Cavalry. This entry was posted in Antiques, family, history and tagged "Custer's Last Fight" Anheuser Busch 1952, Seventh Regiment U.S. Cavalry, The Battle of Little Bighorn by Elizabeth Mozley. Bookmark the permalink.